View your files for your meeting at a glance before you board your flight, without even having to open your laptop. 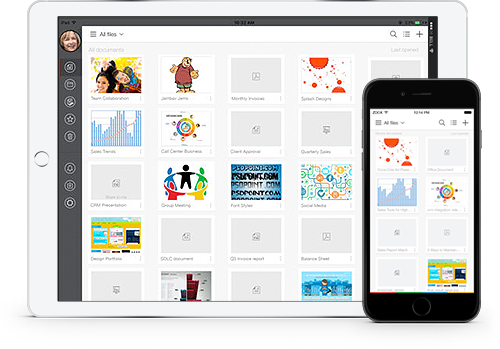 Take your work with you wherever you go with Zoho Docs, available for iOS and Android. For people who do a lot of work on the go, mobile phones are the new laptops. Do away with the hassle of opening your laptop every time you want to view a file. Work in real time wherever you go. Grant access based on each team member's functions. Stay informed about what's happening at work. Edit and share files while waiting for your client, when at home, or while on vacation with your family. If you see a billboard that catches your eye or if you want to save images from an event, just save and move those pictures to the cloud with a single click. Spot your documents instantly. Find scanned copies of your passports, flight tickets, and ID - all at your fingertips.